I'm thrilled to be able to introduce you to today's author, Liz Johnson. This is a very special book--it's her first one and I'm anxious to read it. 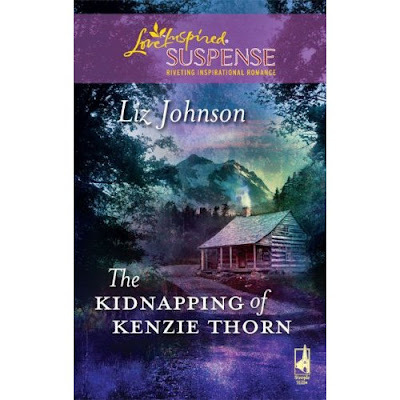 Liz is giving away a copy of her debut novel, The Kidnapping of Kenzie Thorn so be sure to leave a comment for her, with your email addy so I can track you down if you're the winner. The book drawing is open until Saturday evening when I'll visit my favorite random number generator and the winner will be posted on Sunday. Mackenzie Thorn looked up just in time to see two men walk into her classroom. One of them, a guard, nodded at his coworker stationed inside the door, and kept his hand at the elbow of the taller man beside him. This man, clad in an orange jumpsuit sporting the initials ODOC—Oregon Department of Corrections—swaggered into the classroom, head held high, windswept brown hair falling over his collar. The intensity of his blue eyes struck Kenzie immobile for a moment as they approached. "Ms. Thorn," the guard began. Kenzie shook her head to clear her thoughts before holding up one index finger to the guard. "Just a moment, please." Turning to the two men sitting at the first table on her right, she said, "Mr. Ramirez, Mr. Chen, please pass out workbooks to everyone." The two men began their task while she moved to meet her new student. "This is Myles Parsons. The superintendent's office said to put him in this class." The guard made no apologies for bringing in a new student five weeks into their six-week GED session. Decrees from Superintendent JB Ryker's office were law inside these walls. The inmate would just have to try to keep up. The man's piercing blue eyes bore into her face, seeming to study every crevice. She knew for a fact that her face was not that interesting. Mr. Parsons's face, on the other hand, was well worth studying. The crooked bridge of his nose had been broken at least once, but the imperfection was intriguing rather than off-putting. His wide mouth and pink lips pulled into a smirk, exposing his arrogance. Running thick fingers through his shaggy brown hair, he continued staring back at her, something few of her other students had ever dared to do. Suddenly she realized how incredibly inappropriate she was being and ripped her gaze away from his handsome face. "Welcome to our GED prep class, Mr. Parsons." "Yes, I am. You seem surprised." "I am." The man certainly did not mince words. "I expected someone more…" He stretched to his full height, which was at least a foot taller than her. "The way the others talk, I expected someone more intimidating." Despite her skittering pulse, she quirked the corner of her mouth into a partial grin. "Trust me, Mr. Parsons. My tests are plenty intimidating. You may take a seat now. Third row on the left." Effectively dismissing him, she turned to the rest of the class and began teaching the basic fraction lesson. Myles Parsons gazed at Ms. Mackenzie Thorn. Obviously frustrated by her wild, curly hair, she shoved it behind her ears, giving herself streaks of white where the chalk from her fingers lingered in her curls. Her passion for the mundane principles of fractions astounded him. Her voice, like a melody, rose and fell as she singsonged through adding and subtracting the tricky numbers. He shook his head to clear away the distractions of her intense gray eyes. He chastised himself for his own bad luck to end up inside these walls. Her pretty face wouldn't be enough to make his current mission worth it. Somehow, he'd let his FBI supervisor, Special Agent in Charge Nathan—Nate—Andersen, talk him into taking this assignment. An assignment that could be summed up in two words: Kenzie Thorn. When Nate received a tip two weeks before that the governor's granddaughter was in danger working inside the Oregon State Prison Complex at Evergreen, Myles had wondered about the validity of the tip. But Nate believed it, and he'd assigned an agent to the inside to protect her. As the youngest special agent stationed in the office, and one of the few without a family, Myles was the obvious pick to go behind bars to protect Kenzie. Protect her from what, he wasn't sure. But as long as he was on this mission, he'd keep an eye on her. He'd do his job and do it well. Kenzie—Ms. Thorn, as he was going to have to think of her—turned around at the front of the class and flicked another streak of white through her hair, rambling on about finding the lowest common denominator. His mouth quirked up at the corners of its own accord at her spunky head bob, and he had to fake a sneeze in order to keep from laughing out loud. "You're smiling awfully hard for a man who is five weeks behind the rest of the class, Mr. Parsons." Ms. Thorn's voice was soft, and she leaned closer to him, suddenly at his side. She smelled like citrus, like lemon and lime mixed together. Relishing the crisp scent in a room full of mostly unwashed bodies, he looked up into her stormy gray eyes. A row of freckles at the top of the bridge of her nose softened her hard glare, and he physically had to fight a smirk in response to her childlike cuteness. One thing was quite certain. She wasn't going to erase his smile standing this close to him. An intriguing contradiction, her piercing eyes and gentle face tempted Myles to turn this exchange into a flirtation. Shoving those thoughts away, he focused on the mission, knowing he had to keep his mind alert for any signs she might be in danger. Finally, the class ended, and Kenzie took a moment to let her head rest on her desk, trying to clear her mind from the terrible day she'd just had. The day started with Cory Johns, one of her favorite students, cheating on his third and final try at the GED exam, forcing her to fail him. Any hope for a change in his life after his release went in the trash with his exam. The next class brought her new student, Myles Parsons, whose cocky smirk and arrogance made her bristle every time she looked in his direction. He raised his hand to answer almost every question she asked, and even worse, he was always right! Eyes closed and forehead still leaning on her arm draped over the papers littering her desk, Kenzie took the opportunity to pray for her students. God, please give me the words to reach these men. To give them some hope and skills for when they are released. I pray for the families that are eagerly waiting for their return. And, Lord, I pray specifically for Cory Johns. I pray that he will find another way to earn his GED and support his family. And I ask that You give me a special dose of patience for my new student. Please help his attitude to change toward me and this class. Thank You for Your many good gifts. In Your name, Amen. Just as she dragged her head from its resting spot, a noise in the doorway caught her attention. A handsome man with sleek silver hair filled the entire doorway. "Mac!" she cried, jumping up from her seat and throwing herself into the man's waiting embrace. She clung tightly to him as he almost squeezed the breath out of her. "What are you doing here? I wasn't expecting you until tomorrow." "You know how it is." He chuckled, a smile spreading over his face. "Sometimes the governor's schedule changes." He gave her another quick squeeze before stepping back to really look at her. His gray eyes, so much like her own, assessed her carefully and he frowned. "You look tired. Is this position too much for you?" Kenzie resisted the urge to roll her eyes. He said the same thing every time he saw her. "I've been here for two years. I'm doing okay." "Are you taking care of yourself?" "Of course." She looped her arm through Mac's and smiled into his loving face. "I've missed you, Grandpa." She rarely called Mac "Grandpa," and since he was elected governor nearly six years before, she could count on one hand the number of times she had done so. But today she needed to be reminded that she was loved by her father's father, the man who had loved her as a daughter, ever since she lost her parents all those years ago. Mac squeezed her tightly to his side and kissed the top of her head. "Sweet pea, you have no idea how much we miss you in Salem. I can pull some strings to get you a position at a school there. You'd make a wonderful kindergarten teacher. This place is rough. It's not good for you." "It's okay. I'm okay. They need me, and to tell you the truth, I think I need them, too." Kenzie smiled and snuggled a little closer to his side. Mac had always been able to right the wrongs in her life, protect her from the boogeyman, dry her tears. He was larger than life when she was a child, and his presence today almost wiped away thoughts of concern over her new student. She looked around Mac's arm and spotted his usual entourage. "Harry. Buzz." She nodded at each of the men standing just inside the doorway. Harry was built like a bulldozer and Buzz like a long-distance runner. They were part of the best security detail in the state, and Kenzie had grown fond of them through the years, as they protected Mac. "Candace." She acknowledged Mac's personal aide, a tall blonde standing beside Buzz. Candace looked up from the notes in her daily planner. "Good afternoon, Kenzie." She offered a brief smile, then returned to keeping Mac on schedule. "Well, you'd best show me around your classroom." Mac's voice was gruff, but held a grin. "Sure. There's not much to show really. We have tables where the students sit. Our bookshelf is pretty meager, but the prison library has a good selection that I sometimes assign for additional reading, for those that need the practice to prepare for the exam. And of course, my desk." As Kenzie pointed out the tables, sparse bookshelves and her own desk, Mac walked around the room, glancing at the mathematic posters, the only decoration on the gray walls. He glanced twice at a particularly colorful formula, hand-drawn, on a large white poster board, but he didn't comment. "How's the program?" he finally said. "It's wonderful. Since you authorized this pilot program two years ago, we've had more than two hundred inmates earn GEDs. We have almost a two-thirds pass rate. You don't have to worry about us right now. But maybe—"
You can purchase The Kidnapping of Kenzie Thorn from Amazon and CBD as well as at Wal-Mart and other stores. To keep up with Liz visit her at her website and her blog, Liz's Diary. Don't forget to leave a comment to be entered into the book giveaway! Tomorrow is an interview with Liz--see ya then! Driving past an empty field one day I saw a pair of ducks floating in a puddle. I wanted to stop and tell them that there was a beautiful farm pond only half-a-mile away, but I realized the silliness of the thought even as I sped past. I think I'm like those ducks--contentedly sitting in my muddy puddle, satisfied with so little when God has so much more for me. I sit and twiddle my toes in mud instead of moving to the place God wants me to be—a place of blessing and great riches. A place where God can use me. Why do I do that? It's easier to stay in my cozy hole than it it to face the unknown. It's easier to sit in my puddle than to spread my wings and fly to a spot I've only heard is 'just over there'. It's easier to mind my own business than to possibly embarrass myself. I cannot know the riches of His glory while sitting in my little mud puddle. I need to move to the pond God has for me in order to experience the surpassing greatness of His power. Father, open the eyes of my heart that I may know the hope of Your calling. This week Sherri is hosting Fiction Friday for us over at A Candid Thought. Join us there for links to more fun fiction! 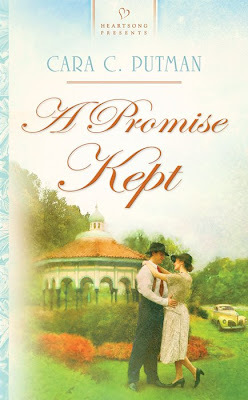 Also, Cara Putnam is in the author spotlight here this week she's giving away a copy of her new release, A Promise Kept. Be sure to leave a comment on Tuesday's or Wednesday's post to be entered in the drawing. Now that our Vacation Bible School is over for our church, our eyes are fixed on the upcoming World Changers trip. This year 3 of my kids will going with 60+ others from our church youth department for a week of work. This is a highlight of their year and they're excited! Throughout the summer many others are going on missions trips, and as you know, missions and missionaries are near-and-dear to my heart. So, for today's Fiction Friday, I'm posting a piece to remind us to pray for those going on missions trips. This was great fun to write because I wove bits of real events in with the fiction. Chillanes is a town in Ecuador, although my description here is NOT accurate of the town, but I wanted to use that town name because two of my favorite missionaries live there--they had a profound influence on my life, whether they know it or not, and I love them greatly. This sort of thing happens quite often on missions trips--unfortunately--but it doesn't have to! Loving people speaks through our actions and crosses all language barriers. I've seen missionaries kill the language but still have a great ministry because of their love for the people. It all comes down to love--God's love in and through us. Remember to pray for the missionaries you know, as well as those going on missions trips this summer! I watched the sugar dissolve as I stirred up another batch of hummingbird feed and marveled that it didn't all dissolve until I heated the mixture. Sure, I could've let it sit on the counter for a couple hours, but I wanted to get the food out to my hummers as soon as possible, so I popped the mixture in the microwave for a quick heat so the sugar would be absorbed by the water, making tasty food for my favorite little birds. It made me think of my dad--he's declared that hummers like his feed mixture better than what my mom fixes. Wanna know his secret? He super-saturates his mix with extra sugar. 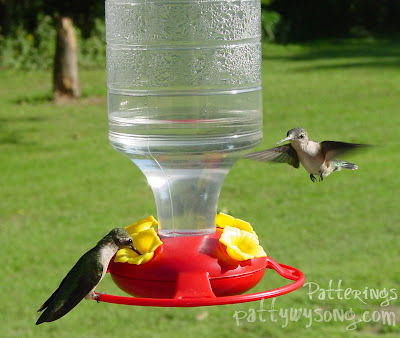 He pulls out a little saucepan and heats the water and sugar to make sure it all gets absorbed by the water, then he cools it and fills the hummer feeders. And it's true—hummers love being at his feeders. My Heavenly Father does something similar with us, His children. He turns the heat up under us so we can absorb more of Him and be better and sweeter feed for others. Without the heat, we wouldn't absorb Him as quickly, nor as much. So when the heat gets turned up in your life remember there's a reason for it and absorb all you can. Don't forget the book giveaway that's going on this week! Cara Putnam is an incredible lady. I still haven't figured out how she manages all that she does, but that's okay. LoL I'm just tickled she's visiting us today! :-) Cara is doing a book giveaway, also, so be sure to leave a comment for her to be entered in the drawing. The giveaway will be open through Saturday evening and the winner posted on Sunday. Welcome to Patterings, Cara! Tell us about yourself and how you juggle all the things you do and still keep your sanity. First, thanks so much for having me, Patty. I was so honored when you asked. I’ve been married for 13 years to a wonderful man. Eric, a boy from Indiana, and I met, a girl from Nebraska, met in Colorado when we were 18 and 16. I’ve always said only God could pull off something like that. Eric says I’m the speedboat zipping around his ocean liner. It’s a great description. I race through life, from project to project, and absolutely nothing fazes him. We have three children with one in heaven and we homeschool. I’m an attorney who lectures in business law at a Big Ten University. I also write books, am active in our church and American Christian Fiction Writers. I have a hard time saying no because I love to help others, but that means I don’t get an abundance of sleep. Tell us about your new World War II series. My second series for Heartsong Presents is set in Ohio during the war and each book highlights a different sibling. Evactuated children, top-secret projects, and baseball, oh my! Where did you get the idea for this series? JoAnne Simmons posted a list of states that were still available, and Ohio is next door. I’d done some research on children evacuated from Britain to the states, and knew that some found their way to Ohio. That provided a hook to the state. I emailed JoAnne that I might be intrested in Ohio, then went back to writing another book. Several months later she emailed me and said that she needed to pick the author for that series, did I have my ideas for her? Needless to say, I hopped on Google and prayed for direction since she needed the proposal in a week. It was so cool to watch God lead me to the two additional historical hooks that I needed to make the three-book series. Which of your books (published or upcoming) has been the most fun for you to write and which character is your favorite? And why. You also write romantic suspense for Love Inspired. Tell us about that series. Deadly Exposure, which released last year, launched the series. Trial by Fire releases in October, and Love Inspired has a proposal for three more books in the series. My romantic suspense is clean, fun, intense, and you just have to race to the end. This series is set in Lincoln, Nebraska, and Trial by Fire allowed me to research arson. You should have seen the librarians as I checked out videos on arson investigation. I can just imagine what they were thinking! Did you have an epiphany moment when you decided you were going to seriously pursue writing and eventually publication? For me it occurred in 2005 when I insisted on going to a book signing at our local Christian bookstore, Carpenter’s Son. I didn’t know then why I was so determined, but there I met Colleen Coble. For reasons unknown to me, she took me under her wing. That fall I attended my first ACFW conference. I had a partial suspense manuscript and tried to soak in everything I could. I left the conference with three invitations to submit to editors. I followed up on those, and received my first contract at the ACFW conference in 2006. That book, Canteen Dreams, was my first printed and the ACFW 2008 Book of the Year in Short Historical. Crazy as this sounds, my husband had just started a graduate program in addition to his job, so I decided the timing was good for me to dedicate evenings to writing. He’d be busy with classes and I could focus on creating books like I’d dreamed. Last night it was hummus with multi-grain Wheat Thins. Tonight it was a homemade chocolate chip scone. And always sweet tea. I pray my readers get the sense that God is active in our lives. That He cares deeply about us. And that He is always there, even when we think He doesn’t care or doesn’t see. Do I really trust Him? Or do I pay lip service to allowing Him to control my life? I say my career is in His hands, but is it really? He continues to ask me to trust Him and allow Him to direct my life. Captive Dreams, the third in my Nebraska historical series for Heartsong Presents, is set in the middle of prisoner of war camps and an airbase. Anna Goodman’s mother is dead, her father has given up on life, and her brother, Brent, goes missing in action in World War II. Even though she has a full-time war job, she feels she must keep the family farm going so that Brent will have something to come home to. She won't let herself think that he might never return. Any dreams Anna has for her future are held captive by the responsibilities the war and life have thrust upon her. If only Anna didn't have to rely on help from German prisoners -- or from Specialist Sid Chance, the cocky know-it-all who oversees the prinsoers' work. In her heart, she knows she can't do everything demanded of her, but whom can she trust to carry the burden with her? A Promise Kept releases to the Heartsong Presents book club this month! It’s my married romance, women’s fiction, historical. Josie and Art Wilson marry in the opening scene. It was a challenge in a fun way to explore what early married love looks like. This book also pushed me deeper because of the women’s fiction angle – Josie experiences a miscarriage. This grows out of my own experience with a miscarriage a couple years ago. Even though I had two children then, three now, that miscarriage was the most painful experience of my life to date. I still grieve for the child I won’t know this side of heaven. Our family is incomplete, yet God has turned even that into good. Don’t worry, the book doesn’t preach about miscarriage, but how the couple handles the experience plays an important role in the book. The historical hook is that they welcome a distant cousin from England into their lives. More than 2000 children were evacuated to the United States, with many more families ready to welcome them before the Germans torpedoed a ship containing evacuated children, ending the program. I read some fascinating books filled with stories of these kids experiences and the research on the impact. Great stuff! I post at least three times a week (Monday, Wednesday, Friday) on my blog Cara's Musings. I frequently giveaway books and talk about my writing as well as introduce readers to other authors. They can also read excerpts from my books at www.caraputman.com. Thanks so much for being here with us, Cara! It was wonderful getting to know you a bit! Be sure to leave a comment to be entered in the drawing for a free copy of A Promise Kept. Have you ever seen a fireman trying to put out a fire with a straw? Neither have I. But I have seen plenty of us living like we're straws--when we're not. I'm so happy to introduce you to Cara Putman today! Cara is an amazing lady--one I'd like to try to follow for just one day to see how she manages all she does. I have a feeling she'd run my legs off. Cara is doing a book giveaway, so be sure to leave a comment for her to be entered in the drawing. The giveaway will be open through Saturday evening and the winner posted on Sunday. Since the time she could read Nancy Drew, Cara Putman has wanted to write mysteries. For years she asked God if this dream was from Him. Her life was full. She graduated with honors from the University of Nebraska-Lincoln (Go Huskers! ), moved to the Washington, DC area, married the man of her dreams, worked in the non-profit world, went to George Mason Law School at night while working, and then started having children. While her life was far from empty, the dream wouldn't die. Then she followed her husband to Indiana. Talk about starting over! In 2005 she attended a book signing at her local Christian bookstore. The rest, as they say, was history. There she met Colleen Coble. With prompting from her husband, Cara shared her dream with Colleen. Since those infamous words, Cara's been writing books. Heartsong Presents published a three book series of World War Two romances: Canteen Dreams (October 2007), Sandhill Dreams (May 2008), and Captive Dreams (September 2008). Love Inspired Suspense published her first romantic suspense in May 2008. And the Complete Idiot's Guide to Business Law (don't ask!) came out in May 2009. This month, the first book in an Ohio World War Two series, A Promise Kept, is released, also published by Heartsong Presents. Cara is also an attorney, lecturer at a Big Ten university, women's ministry leader, and all around crazy woman. Crazy about God, her husband and her kids that is. Josie begins her newlywed life with excitement and love. Art Wilson is everything she hoped for in a husband. It seems her prayers have been answered as many dreams come true. But when one dream dies, Josie is not sure her wounded heart will ever heal. Art Wilson adores his bride and can't spend enough time with her. But he never anticipated how challenging marriage could be, especially with the distraction of a new job in a strange city coupled with the arrival of a distant cousin seeking refuge from the bombings in London. Josie and Art both wonder where God is when one dream dies and another is blessed. Can they keep the promises they made and build a love that will last a lifetime? The tick of the second hand rounding the face of the grandfather clock jarred the sudden silence in the small church anteroom room. Josephine Miller stared at it, praying it could somehow speed up. Her wedding would start in a matter of minutes, the thought was wonderful. Why did time slow and each second seem to take a minute when all she wanted to do was sweep out of the room and race down the aisle? . In the middle of these crazy, uncertain times, Art Wilson had swept her off her feet and made her feel cherished in a way that blocked out everything. She turned to look in the mirror where it stood against the wall, fingers fidgeting with the pleats as she scanned her appearance. Her white gown flowed around her like a dress designed for a princess. Mama had managed to tame her hair into a sleek upsweep, so different from how she looked most days. Her mother sighed, and Josie caught her gaze in the mirror’s reflection. Joy bubbled around the butterflies filling her stomach. The day she’d longed for had arrived. Only one thing would make her joy complete. They’d make their first home in Dayton. Her smile faltered in the mirror. How she wished Art hadn’t accepted a position miles from Dayton and home. She knew the job would provide a strong start for them, an opportunity Art hadn’t found in Dayton. Her dreams they’d start life in a small apartment near Mama and Daddy had evaporated. Instead, they’d head to Cincinnati. She’d longed for an adventure, and this move fit the bill. The chance to launch their life on their own was reality. While it might not have been her initial dream, a tingle of excitement edged the glow of anticipation she felt when she thought about her new life with her husband. Husband. She rolled the word around in her mind again and again. Heat flushed her cheeks as she thought of everything the word meant. God had blessed her! “Josephine Miller, you’ll be late to your own wedding if you don’t move.” Her younger sister Kat’s sharp words pulled Josie from her thoughts. Mama laughed as Josie fiddled with the bottom of her lace jacket. It topped a floor length, lace covered gown that made her feel like a movie star or wealthy socialite. The door groaned on its hinges as it pushed into the room, making way for Carolynn Treen. Carolyn had done an amazing job pulling together the wedding of Josie’s dreams. Josie’s breath caught at the thought. “I’ve waited a long time for this moment.” Friendship followed by a courtship. Josie had known before Art asked that he was the kind of man she wanted to marry. His firm character and commitment to God made him the one she could imagine spending the rest of her life with. Josie lowered her chin demurely as she obeyed. “When you put it that way, I’m surprised you didn’t push me out sooner.” Josie tried to make her expression match her stern words, but couldn’t. Tickles of joy pulsed through her. The tickle turned to full-fledged, gut-splitting happiness. Oh, to be thirteen again with unlimited wisdom. The look on Kat’s face telegraphed she sincerely doubted she’d ever be as crazy about someone as Josie was for Art. Josie hugged Carolynn, then brushed the top of the comb holding the veil back in place. Artificial pearls dotted the top, hiding the stems of the baby’s breath lining the veil. Josie sucked in a deep breath and eased it out as Mama slipped from the room. She loved Art to the very core of her being. She’d been amazed to realize one could know something so important in a matter of days. He treated her like a treasured gift, someone he couldn’t believe he’d wooed. The music changed to the sweet strains of It is Well with My Soul. It might not be everybody’s idea of wedding music, but every time she heard it the words spoke to her soul. She longed to race through the door and up the aisle of the community church. Art and the minister would stand at the front, waiting for her. “I’m ready.” She slipped her hand through his arm and closed her eyes. When she opened them, Kat slipped past her. Kat’s green dress highlighted her pale complexion and reddish highlights. Kat had taken after Mama’s Irish heritage, while Josie looked more like her daddy’s mother. Carolynn squeezed her hand before she moved out the door and to the sanctuary. How could she say good-bye to Carolynn? The friend who had cried and dreamed with her? Daddy tucked her closer to his side. Together they stepped toward the sanctuary and her future. 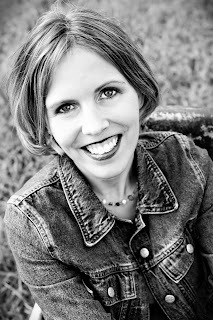 You can visit Cara at her website: http://www.caraputman.com/ and her blog, Cara's Musings. You can order A Promise Kept from Heartsong. Be sure to join us tomorrow for an interview with Cara, and don't forget to leave a comment to be entered in the drawing for a free copy of A Promise Kept from Cara. This last week Debby Mayne was here at Patterings and Esther is the winner of Love Finds You in Treasure Island, Florida. Congratulations, Esther! Coming up on Tuesday and Wednesday, in this week's author spotlight, is Cara Putman and another book giveaway. In today's instant society there are mixes and powders for everything, but the one that makes me snicker most is baby powder. I can just see a little girl stirring water into baby powder and expecting a baby. Life isn't always instant though. In fact, none of the great men of God were instant men—they were gourmet. It was years after being anointed king that David finally took the position God told him he would have. During those years he was basically made an outlaw by his father-in-law, yet he never became angry nor bitter about the amount of time that passed. He did what God put before him, and he sought God's leading constantly. God used those years to better prepare David for the purpose He called him to. There have been many times in my life that I felt I was going nowhere—simply treading water, and killing time. But that's not how it was. God was using those times to prepare me, and He's still preparing me. Am I following David's example of not becoming impatient or angry? Am I seeking God's next step for me and making myself available for His use? Gourmet cooking is not a 'just add water' affair. It takes time and energy and even special ingredients...I'd rather be God's gourmet dish than my own instant generic-box-blahness. Be sure to check out this week's author spotlight--it's Debby Mayne and she's doing a book giveaway--just leave a comment on *Tuesday's or Wednesday's* post to be entered in the book drawing. Also, don't miss Debby's book trailer posted on Tuesday--it's wonderful! And now for Fiction Friday! Our host this week is Joanne of An Open Book. Join us there for links to more fun fiction. Thanks, JoDear. Don't forget to enter this week's book drawing! Thanks so much for being here, Debby! Tell us a little about yourself. My dad was in the military, and I moved every couple of years during my childhood. Books became my best friends when I didn’t know anyone. I’ve lived in Alaska, Hawaii, Mississippi, Tennessee, Oregon, Japan, and Florida. I started writing articles and short stories when my children were babies. After they were old enough to fix their own peanut butter sandwiches, I started trying to write books. It took me five years to sell my first one, and I’ve been steadily published ever since. I started out writing articles for regional parenting publications shortly after my first daughter was born. When I learned a new parenting skill, I wrote an article about it because it was fun, interesting, and a great way to generate a little income while I stayed home with my babies. Since I was such an avid fiction reader, my husband challenged me to write novels. I’ve been writing articles for 26 years and novels for 15 years. Were there any turning points in your writing career? My writing career has had so many turning points I’m dizzy. I wasn’t one of those people who knew from an early age that I wanted to be a writer. The career evolved from a love of reading great stories. Shortly after I thought about writing novels, I decided to focus on Christian fiction because I never wanted to compromise my faith. The Love Finds You series is wonderful! What made you choose to set a book in Treasure Island, Florida? I had a story that I’d initially titled Bicycle Built for Two set in a beach town. When the Summerside Press editors asked me to find a town that worked with the theme of the story I proposed to them, Treasure Island was a perfect fit. Which character in your novel most interested you while you wrote? Why? Harold is a very smart man who just happens to have Alzheimer’s. Everyone around him thinks he’s a grouch, but he’s simply frustrated because he’s aware of the changes he’s experiencing. My heart goes out to him for having to deal with something he has no control over. Which of your books (published or upcoming) has been the most fun for you to write and which character is your favorite? Why? I like all of my books—especially the ones I’ve written over the past couple of years. In addition to Harold from Love Finds You in Treasure Island, I love Carol Scheirer in “Silver Bells,” a novella in my upcoming Christmas Homecoming anthology that will be out in September. She’s the grandmother of the other three heroines in the collection. After being widowed for several years, she has a chance at love again. Are there certain foods or snacks that keep the words flowing for you? Anything spicy, coffee flavored, or covered in chocolate will keep me going for days. I love the beach, New York City, and visiting my daughter, son-in-law, and granddaughter in North Carolina. Unconditional love, forgiveness, and mercy. Patience. I’ve always been one to watch the pot of water, waiting for it to boil. I’ve learned that it takes time to make anything worthwhile happen. I have several books coming out this year, including Christmas Homecoming in September, Noah’s Ark in October, and Be Still…and Let Your Nail Polish Dry in November. Christmas Homecoming is an anthology I wrote with Paige Winship Dooly, Elizabeth Goddard, and Elizabeth Ludwig. As I mentioned earlier, my heroine is the grandmother of the other three heroines in the book. When she calls her family home to share a special day, her granddaughters don’t hesitate, and they’re there by Christmas. Noah’s Ark is the first of three contemporary books for Heartsong Presents set in West Virginia. My hero Noah is a veterinarian who serves others to the point of neglecting his own personal life. Be Still…and Let Your Nail Polish Dry is a devotional for busy women. Andrea Boeshaar came up with the concept then invited Sandie Bricker, Loree Lough, and me to join her in writing it. We’ve started a blog leading up to the release date, so please stop by http://bestilldevos.blogspot.com for a sample of what you’ll see in the book. You can purchase Treasure Island from Amazon and CBD. To learn more about Debby, visit her website at: http://debbymayne.com or at her blog. If you missed Debby's book trailer for Treasure Island, be sure to scroll down to yesterday's post and watch it. It's wonderful! And she's giving away a book this week, so be sure to leave a comment to be entered in the book drawing. Thanks so much for being with us, Debby! And since it's Tuesday, that means it's Author Spotlight day. :-) Today I'd like to introduce you to Debby Mayne. Debby is doing a book giveaway, so be sure to leave a comment for her to be entered in the drawing. The giveaway will be open through Saturday evening and the winner posted on Sunday. 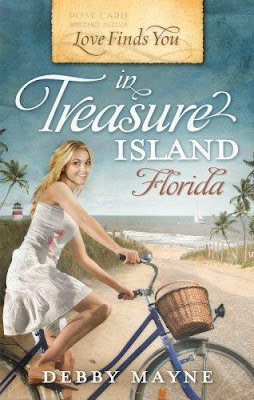 Debby's new release is Treasure Island is part of the Love Finds You series that so many of us have come to love. Summerside Press, publisher of the Love Finds You series says this: "The LOVE FINDS YOU™ series gives readers a taste of local life across the United States. The novels—uniquely titled after actual American towns with quirky but intriguing names—inspire romance and fun. Each fictional story draws on the compelling history or the unique character of a real place. Stories center on romances kindled in small towns, old loves lost and found again on the high plains, and new loves discovered at exciting vacation getaways." It's a series that delivers wonderful books. 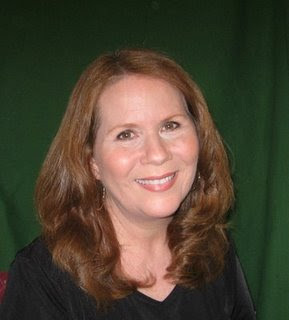 Debby Mayne has published more than 20 books and novellas as well as approximately 400 articles and short stories. She has worked as the managing editor of a national health magazine, product information writer for a TV retailer, and as a copy editor and proofreader for several book publishers. Debby lives on Florida’s west coast with her husband and two cats. To learn more about Debby, visit her website at: http://debbymayne.com. Amanda, a bicycle shop owner in Treasure Island, Florida, and Jerry, a businessman from Atlanta, have always put their personal lives on hold to care for needy family members. After being jilted at the altar and never knowing her father, Amanda doesn’t want to risk the pain that love inevitably brings. Jerry’s parents face insurmountable obstacles after being diagnosed with age-related illnesses, so he puts his personal life on the back burner so he can always be there for them. They try to deny their mutual attraction, but everyone else makes it their business to bring them together. Is it possible that Jerry’s father, who refuses to give up on his never-ending and annoying treasure hunt, knows something that they all need to pay attention to? “You married?” Mr. Simpson said. “Oh, that’s okay.” Amanda glanced back and forth between the couple. She finally settled her gaze on Mr. Simpson. “No, I’m not married.” The heat of embarrassment crept up her cheeks. And here's a first for Patterings! Debby has a book trailer, and I loooove it! Mayne writes a wonderful novel about all of life's relationships, including son to aging parents, sister to sister, friend to friend, grandfather to grandson and, of course, love between a woman and a man. It's wonderful how she weaves all these different and complex relationships into one story and keeps it moving. This is one novel that will be treasured long after the final page is turned. 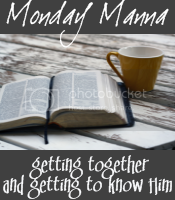 Today is Monday Manna at An Open Book and Joanne gave us a verse with few words, but it packs a punch! There is no straddling this fence. When we lived in sin, we lived in blackness—complete darkness. But those of us redeemed by Christ, having been washed by His blood, are clothed in white robes—the righteousness of Jesus. Because we are freed from sin (past tense) we no longer have to live (present tense) as slaves to sin. We do not have to follow the dictates of sin. Sure, sin will try to entangle us, entrap us, sweet talk us and command us. But Jesus freed us from having to listen to, and obey, sin. We can cling to Jesus and through HIS righteousness we can live. This last week Trish Perry was with us and she gave away a copy of her new release, Sunset Beach and Mez is the winner! Thank you, Trish! Coming up this week is Debby Mayne. Be sure to join us Tuesday and Wednesday for a chance to win a copy of her new realease Love Finds You in Treasure Island, Florida. I have to admit, I don't have a cleaning schedule for my bathroom anymore. I used to, but it's kind of fallen by the wayside. But that's not to say that my bathroom doesn't get cleaned because it does! *grin* It's just on an as-needed basis. Toilet: (preening) See, I get cleaned when I need it. It's better than waiting for a scheduled cleaning day to arrive. Tub: Humph. You're a toilet. Of course she cleans you more! You need it! Toilet brush: You ought to handle sin the same way. Just deal with it on an as-needed basis so it doesn't build up and make your life scuzzie. Just scrub, swish and flush it right away as soon as you spot it. Toilet: Yeah! That's how you do it! Hey, scrub a little harder in there and don't forget the top part. Tub: Now wait just a minute there! There's nothing wrong with scheduled cleaning—for dirt and sin! It's the only way to make sure everything gets cleaned well, especially places that aren't in the main flow of things. Toilet: Ooooooooh. Very good point. Toilet brush: Did she skip her cleaning date with you again, Tub? Tub: *sigh* Yeah, she did. I hope she notices the gray grungies soon. This is getting embarrassing. LoL—Patty here again. Aren't you glad you don't hear things talking inside your head? I giggled as I scrubbed...and remembered my neglected tub. There's a lot to be said for scheduled cleaning—and scheduled time spent alone with God searching, cleaning and confessing things. I'm going to go grab my cleaning bucket and doing some praying while I'm scrubbing that poor tub. What's your tub saying to you? Welcome to Fiction Friday! We have a technical change for Fiction Friday linking up procedures. Due to technical difficulties others have experienced, we will not be using "Mr. Linky" any longer. When participating in Fiction Friday leave your url in a comment on the host's Fiction Friday post (which is right here today). This is fiction! Truly. But I've been whammied like this many times by things from a child's mouth. I think it hurts more when the message comes through a child. sigh. This week's spotlighted author is Trish Perry and she's giving away a copy of her new release. Be sure to leave a comment to be entered in the book drawing, which will be open until Saturday evening. This book Trish is giving away sounds wonderful! I'm happy to welcome Trish Perry back today for an interview. 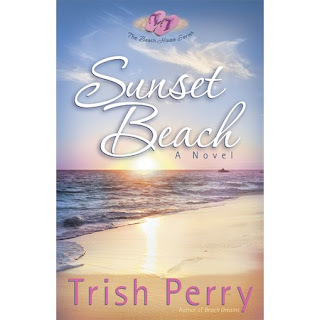 Trish is giving away a copy of her new release Sunset Beach. The book drawing will be open until Saturday evening, so be sure to leave a comment (with your addy to help me track you down) to be entered into the drawing. Trish, tell us about your Beach House series. Actually, the Beach House series is novelist Sally John’s creation. Sally wrote the first two books in the series, and I wrote the next two. There are two characters who appear in all four books, but otherwise, each book in the series involves a different cast of characters. The house itself is the other constant “character” in the series—it’s a funky little, chotchkie-laden get-away in San Diego that was once owned by a sweet little old lady who has since joined her Maker. Everyone who visits the beach house undergoes a change—always for the better. I think Sally had a great idea, and it was a blessing to be involved with the beach house. Where did you get the idea for the series? The series was Sally’s idea. The two books I wrote evolved very comfortably for me. My first foray into the series involved characters I had already created in my first two novels (The Guy I’m Not Dating and Too Good to Be True). I was dying to tell the third story in that series. So when Harvest House asked me to write Beach Dreams, it seemed like a perfect fit. Sally’s setting; my characters. Then, for Sunset Beach, I needed to develop all new characters and an entirely unrelated story. God blesses me with ideas so often, I have a hard time remembering exactly how my ideas come about. He just plants little snippets in my head while I’m in the shower, doing the dishes, sitting in front of the computer staring ahead like a zombie. When I look back after the fact, it’s always hard for me to pinpoint the genesis of each step in the process. Which book (published or upcoming) has been the most fun for you to write and which character is your favorite, and why? Wow, that’s such a hard one. I’d probably give you a different answer on any given day. Today I’ll say that Too Good to Be True was the most fun. I had just finished writing a much more serious novel (which I haven’t published yet), and I was dying to do something funny and light. That was when I wrote Too Good to Be True. It had some serious issues and moments, but the heroine and her interactions with her mother and the hero made me laugh. As far as my favorite character, today I’ll say it was Aunt Addie from The Guy I’m Not Dating. I remember sitting in a tire shop while my car was being . . . tired, and this spunky older lady walked in wearing a perky red jacket and sporting a grey bob haircut. I grabbed a little pad of paper from my purse and drew her right then and there. She became Aunt Addie, a dear woman who is occasionally dotty and occasionally spot on with her observations. She was an excellent foil for my bad girl. Loved her. Which character that you've written has most interested you while you wrote? Why? Sonny Miller, the heroine in Sunset Beach, was an interesting one for me. She got her college degree, as I did, in Psychology, but she was far younger when she achieved that. And everything else about her was so different from me, as well. She was completely in the dark about her family of origin, and I was intrigued to imagine a girl going through life without knowing any family member other than her mother. It made me hungry, emotionally, thinking about what that must have been like for her. It’s hard enough to grasp one’s identity when you know much about your own background. Imagine trying to have your feet firmly planted on the ground when you don’t know, really, where you came from. You have an interesting background! What prompted you to start writing? How long have you been writing? Were any turning points in your writing career? I started writing creatively about 19 years ago, when I was taking my college courses (as an adult). I developed the itch to write but didn’t quite recognize it. When I submitted some of my English assignments, my professors encouraged me to write more. So I took as many creative writing courses as I could cram into my Psych degree, and I was working on my first novel by the time I graduated. A turning point in my writing career actually came as I neared the completion of my degree. I was making the bed, praying to God, asking Him for some guidance about whether to go on to grad school (for Psychology), as I originally planned, or take some time off to write. He “spoke” to me in a lovely way as I was tucking in the sheets. I’ll never forget it. I thought I was taking two years off from my Psych work. I never went back. In Sunset Beach Sonny has just finished her psychology degree. Are there other similarities between you and Sonny? Do you write yourself into characters at times? Since I happened to choose Sonny as the character who most interested me, above, I’ve probably answered this to some extent. As far as writing myself into characters, that has never happened deliberately. But I think the snarkier comments from some of my characters couldn’t come about if I wasn’t able to think of them, personally. I can get pretty sarcastic, and I grew up around British humor, which might surface through some of my characters on occasion. But I never mold any of my characters around myself or anyone else I know. Now, how did you know about that? Yeah, that’s the worst! When I’m sitting here jamming away, I’m fine. But when I’m between bursts of brilliant inspiration, I get the major munchies. Cashews are a big favorite, and when I’m really bad, Cheetos and Lay’s potato chips go down beautifully and quickly and straight to my git along. LoL Well, I really didn't know but it was a bit of an educated guess. What is the quirkiest thing you have ever done? I don’t really do quirky things as often as I do embarrassing things. I’m sitting here, spending way too much time reliving some of the stupid things I’ve done in public. It’s having a very bad effect on my delicate self-esteem, so I’m going to pick one incident and move on. I tend to wear comfy pants around the house when I’m writing, and I have a pair of running pants that are a little too long. One day I kept stepping on the backs of those pants, so I got two diaper pins, pulled the pant legs up from behind, and haphazardly pinned them onto the calves of the pants so they wouldn’t annoy me. Several hours later I needed to make a run to Costco and I noticed a few guys checking me out as I walked past them. Yeah, I’ve still got it, I thought. Uh, no. What I still had was diaper pins holding up the backs of my pant legs. That’s me all over. All I needed was a beanie with a propeller on top to finish off the look. I almost always wear jeans, but today was a yoga pant day and I thought about your story as I ran into the grocery store. *grin* You're not just a writer, you're a reader too--what kinds of books you enjoy reading? I always prefer novels, but I read a wide array of books. Romance, humor, historical, literary, classic, you name it. I tend to mix it up as I go, so if I read something dark and heavy, I’ll usually follow with something that will make me laugh or at least smile. But, oh, do I love to read. I actually get excited when I know I’m going to have a little time in the evening to read before bed. Last year at the ACFW conference, Robin Jones Gunn talked about the fact that the Lord has given each of us overriding themes that will keep showing up in our work. I was struck by the fact that all of my work has involved the importance of listening to the Lord’s guidance. I’ve never set out to incorporate that idea into what I write, but He has clearly put that issue on my heart. I look back at books I’ve written, and I see that message there, at the bottom line, every time. He’s definitely impressing upon me the need to give the day’s work to Him every morning. I’m a tad overwhelmed with work at the moment, and there’s no way to get everything done that needs to be done. So I’m forced to give each day to Him and trust that I’ll hear His guidance about what to work on first. What a good lesson for me to hear right now, Trish! Thank you for that. Can you tell us about what you have in the works? I have nine book proposals out there at the moment, with one more due to another publisher. I’m just waiting to see what the Lord wants me to do next, assuming He has another book in mind. I hope to know something soon, but the break is badly needed and perfectly timed. A total blessing. Patty, thanks so much for the interview! I enjoyed it. And thank you for being here, Trish! It's been wonderful getting to know you! Here's an excerpt of Sunset Beach for you to enjoy! 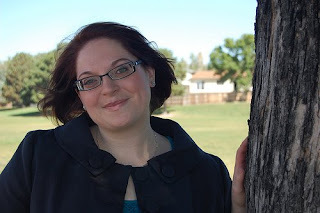 To keep up with Trish, visit her at www.trishperry.com and at her blog where she does fun author interviews and book giveaways. Don't forget to leave a comment to be entered in the book drawing! Also, I'm posting today at Adding Zest. Join us next week to meet Debby Mayne! You can also visit Trish at her blog where she does fun author interviews and book giveaways. Tomorrow is an interview with Trish. Don't forget to leave a comment (with your addy) to be entered in the book drawing. This last week Lisa Lickel was here and she gave away two books. The winner of Healing Grace is Linda, and Joanne has won The Gold Standard. Congratulations, ladies! Coming up on Tuesday and Wednesday is Trish Perry and she has a copy of her new release for us, too. Over at Adding Zest there's a silly poll that really does have a purpose--but we'll get to the purpose later on. Be sure to join us and to cast your votes! There's an area we go through on our way to church that stinks. Always. Regardless of the temperature and weather conditions. It always smells of mildew. What would make a pasture perpetually smell mildewy? There's an old stand of trees at the edge of the pasture and the remains of an old barn can be seen—just barely. The way the trees are arranged, there could have been a house in there too, years and years ago, but if there was, it's all rotted into the weeds. All that's left of the small farm is a pile of debris. Rotting, smelly debris. It makes me stop and think about my life. Do I have areas that perpetually stink? If I do, I can tell you right where the stench comes from. Sin. Buried sin. Sin that I hoped would rot away into nothingness so it would be invisible. But sin doesn't do that. It stinks even as it hides. I don't want that in my life! I don't want to have to smell it and I don't want people around me wondering what the yucky smell is. Not only that, but when my life is over I don't want a stench to linger after I'm gone. You know what I'm talking about—the kind of life that when people hear a person's name they think, 'Eeeeeew' or they're filled with bad memories. I think I'll do some sniffing around in my life, looking for smelly sin that needs to be confessed and gotten rid of. But before I do that, I'm going to spend some time asking God for a sensitive wiffer so I can smell the sin better.